We started Southern Sky Aviation after seeing an opportunity to provide services that didn’t exist from a local company at BHM, our home airport. We believe that when you are doing business and focused on your local community you always strive to do a better job. It is our commitment to Birmingham to hire local and train our team to do it the Southern Sky Aviation way, while building a world-class aviation company here in our home city. For our team, there is no greater passion than that of serving our guests, clients and partners in the pursuit of a better way to fly. We embody this effort and strive to create an aviation experience like no other. All facets of Southern Sky Aviation are designed to enhance the way our customers connect with what we believe are some of the most important moments in their lives. With certified pilots, expert maintenance professionals and avionics specialists, we are providing the safest, most enjoyable aviation experience in the region. Welcome aboard. Bill is the Chairman of the Board of Southern Sky Aviation and this is not his first appearance in the Birmingham Business scene. He started the prescription drug card company, Rx Benefits in the mid nineties and built it to be one of the premier employers in the Birmingham area. Rx Benefits became a leading national company for prescriptions benefit management in the small employer space under his leadership. After selling that company, he turned his attention to the aviation industry in Birmingham, Alabama. 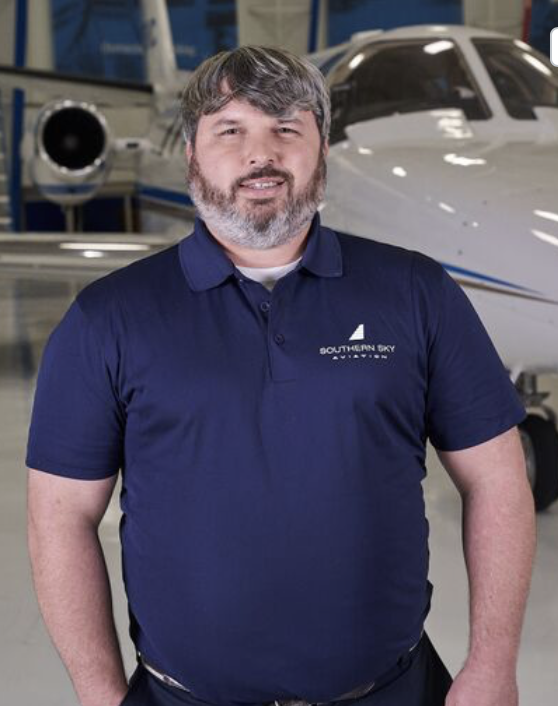 Southern Sky Aviation is a company that Bill established to fill a void in the Birmingham Aviation Industry and looks forward to offering great service and continued growth in 2019. 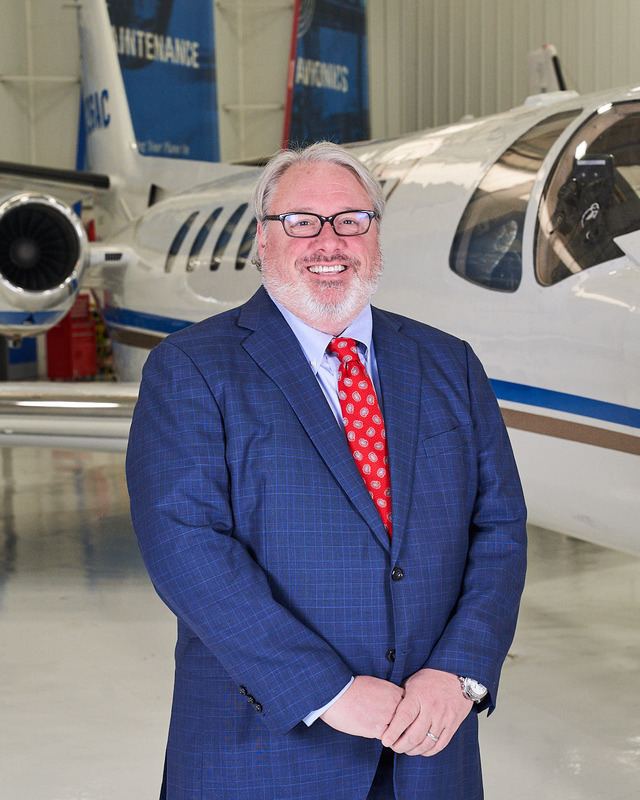 As CEO of Southern Sky Aviation (SSA), Bo Andrews oversees the company’s day-to-day operations, as well as, maintains his status as a pilot. He has been a commercial pilot for twenty-five years and is experienced in multiple types of aircraft. Bo has logged over 8,000 hours in his aviation career and is the Accountable Manager of SSA’s FAA 135 and 145 Certificates. Bo has an undergraduate bachelor’s degree from Faulkner University in Criminal Justice. He is a charter member of the National Criminal Justice Honor Society. He also holds a Juris Doctorate from Birmingham School of Law, graduating as a member of the Judge Hugh Locke Honor Society. In 2000, Bo became the Director of Investigations for Saks, Inc Department Stores. 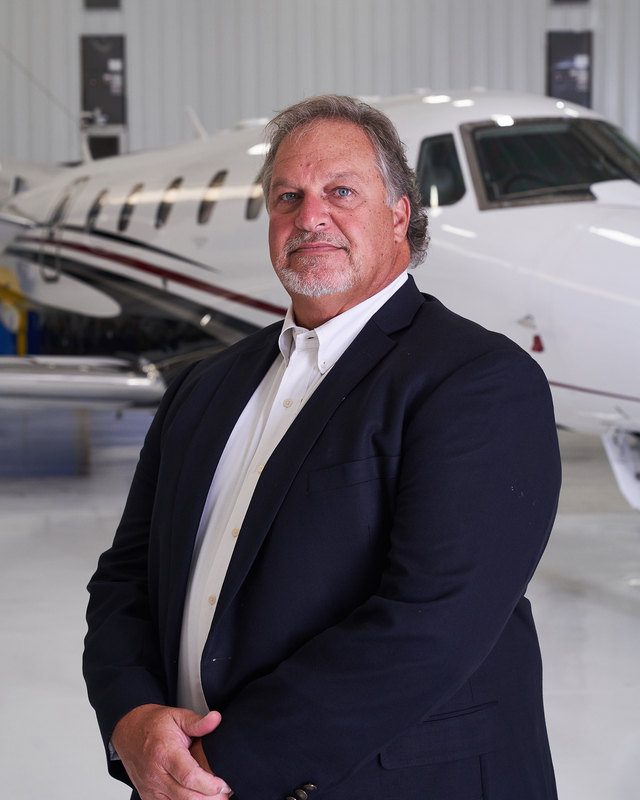 By 2007, Bo began to blend his aviation and private sector law enforcement experience, volunteering his support to the State of Alabama Aviation Division and flying for Rx Benefits as a contract pilot in a Beechcraft Bonanza, a King Air E90 and a Cessna Citation 560. In 2010, he moved over to Protective Services as an Alabama State Capitol Police Officer under Governor Bob Riley’s administration and then moving on to Special Operations Unit in Pell City, Alabama. By 2010, Rx Benefits had experienced a need for a full time Aviation Division. In 2011, Bo was promoted to Chief Pilot of the RxBenefits Aviation Division. The company sold in 2015 and Bo and Bill Gunnells (RxBenefits, Inc CEO) started a company today known as Southern Sky Aviation LLC. 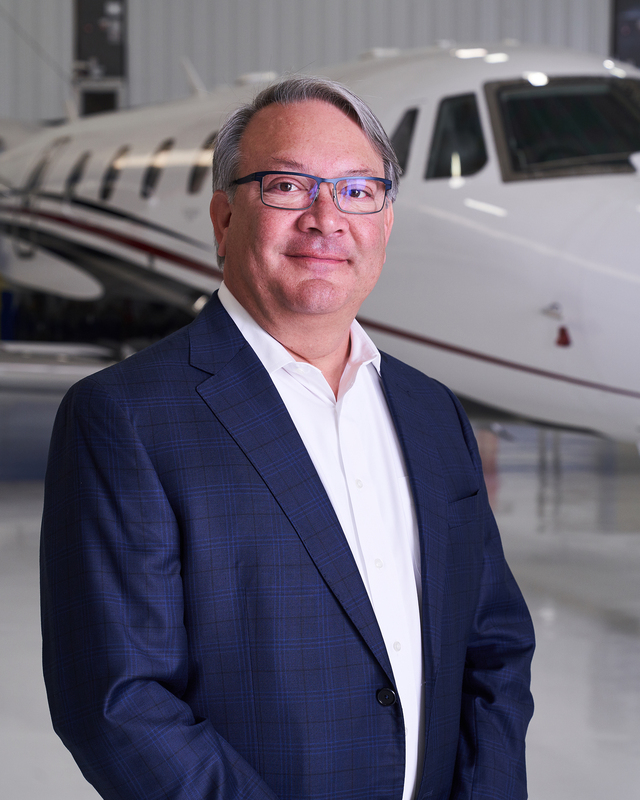 Donald joined Southern Sky Aviation in February 2018 as Chief Financial Officer and assumed the dual role of President and Chief Financial Officer in November 2018. He is responsible for overseeing daily operations across all service segments of the business and has overall financial responsibility for the company. He also works with the Chairman Bill Gunnels and Chief Executive Officer Bo Andrews on setting strategic direction of the company and identifying target acquisitions. Donald graduated from Auburn University in 1990 with a degree in Accounting. He is a licensed Certified Public Accountant with 27 years of public accounting experience in the Aviation, Distribution, Healthcare, Manufacturing, Retail and Distribution Industries. He also specialized in advising clients on Mergers and Acquisitions. Donald’s public accounting experience included 12 years at Arthur Andersen, 2 years at KPMG and 13 years as a partner in a local firm. After 27 years in public accounting, Donald served as Executive Vice President/Chief Financial Officer and Chief Executive Officer of a consumer product start-up manufacturing company. Donald was instrumental in launching this company from its inception and through the first three years of growth. He managed the international supply chain reducing costs by 33%. In addition, he also managed the intellectual property owned by the company. The company sold its assets to an investor group in February 2018. Mike is our Director of Maintenance on our 135 Certificate as well as our Vice President of Quality on our 145 Certificate. He reports directly to our 135 Certificate Accountable Manager, Bo Andrews. He has over 35 years’ experience in Aviation Maintenance and 20 of those years have been in a management role. Much of this time was spent with General Aviation companies such as Beechcraft, Constant Aviation and Beech Aerospace. He brings invaluable experience to our shop, not only from a quality standpoint but in a training capacity as well. Magan Batchelor joined Southern Sky Aviation in November of 2017 as a Senior Accountant. She is responsible for assisting in the day to day operations and financial reporting of our maintenance, flight school, and corporate divisions. 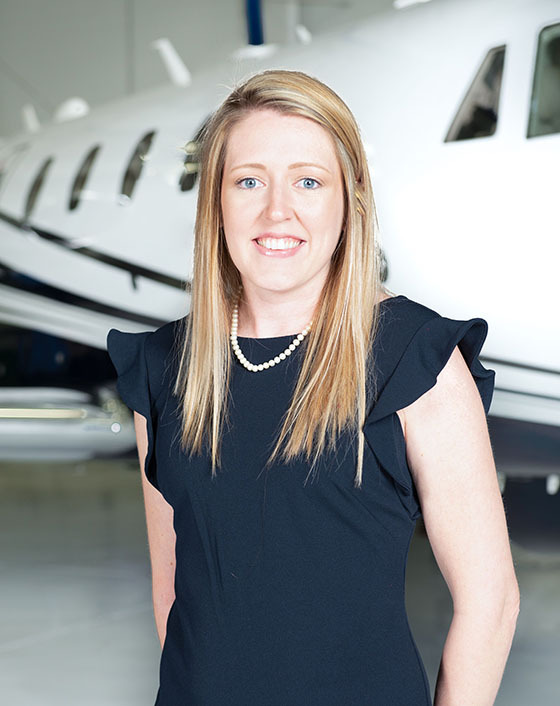 Prior to joining Southern Sky Aviation, Magan served as a Senior Accountant at RxBenefits, Inc. where she worked with the accounting team during periods of large growth and a subsequent acquisition. Prior to her time with RxBenefits, Magan spent over seven years in various bookkeeping and accounting positions with increased responsibility in the manufacturing and childcare industries. Magan earned a Bachelor of Science in Accounting from Jacksonville State University. She qualifies as CPA eligible and is currently preparing to sit for the CPA exam. Darryl Brewer, Southern Sky’s vice president of business development, has been proud to call BHM home since 1978, working in various positions for nine FBO’s since that time. 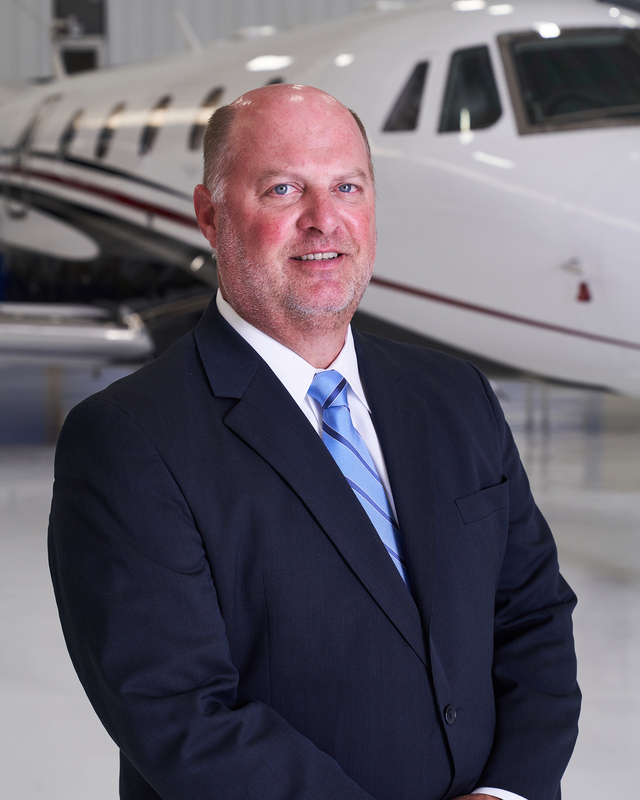 Darryl has been the General Manager of several of BHM’s FBO’s, to include Mercury Air Center, JetSouth and most recently Atlantic Aviation since 1999. 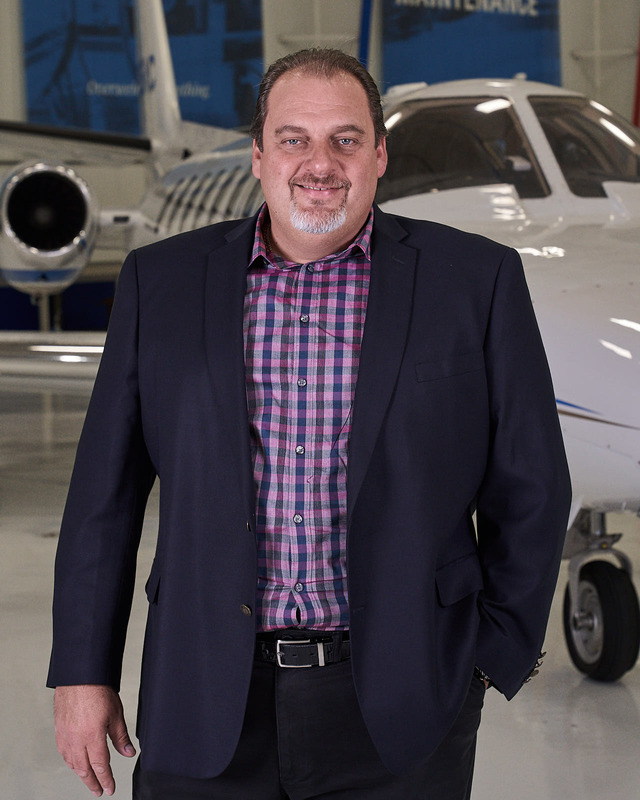 As VP of Business Development, Darryl is utilizing his personal relationships with Aviation Professionals throughout the country to expand the footprint of SSA nationwide and beyond. Everyday he works to ensure that, whether purchasing a new aircraft, maintaining you investment or chartering a flight, our customers know that their schedules and expectations come first. 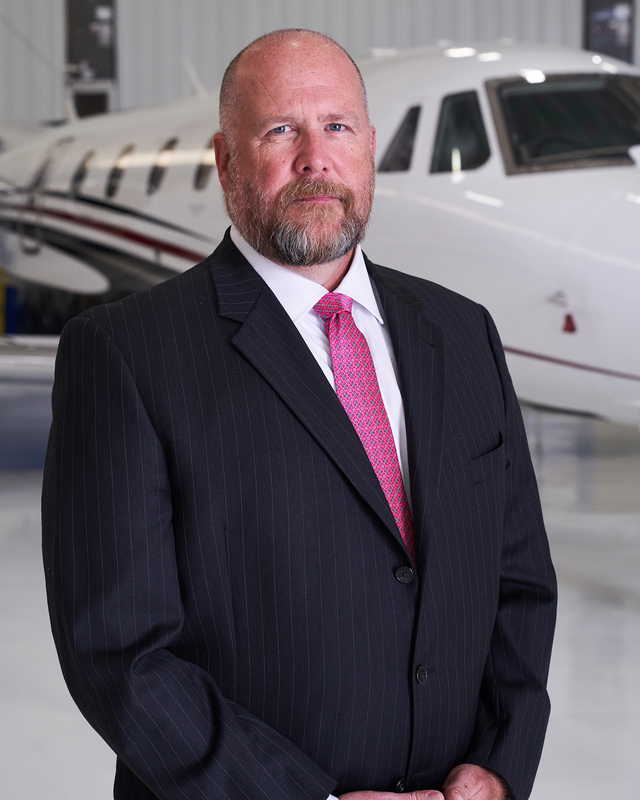 Jeff Cotton is the vice president of operations for Southern Sky Aviation. 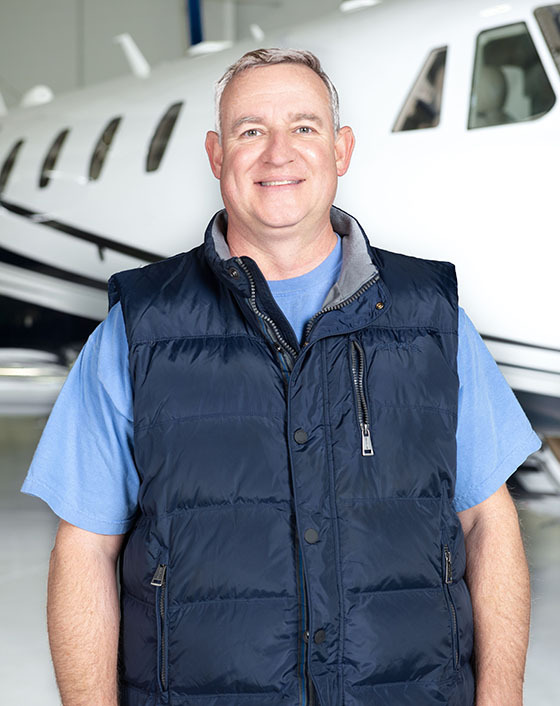 Jeff is responsible for all Southern Sky Aviation aircraft and pilots, hiring and training of all pilots, overseeing flight school activity, assigning flight crews, and ensuring that aircraft maintenance is completed. In addition to his many duties, Jeff’s experience is necessary in keeping the company’s FAA 135 Certificate operational and compliant. 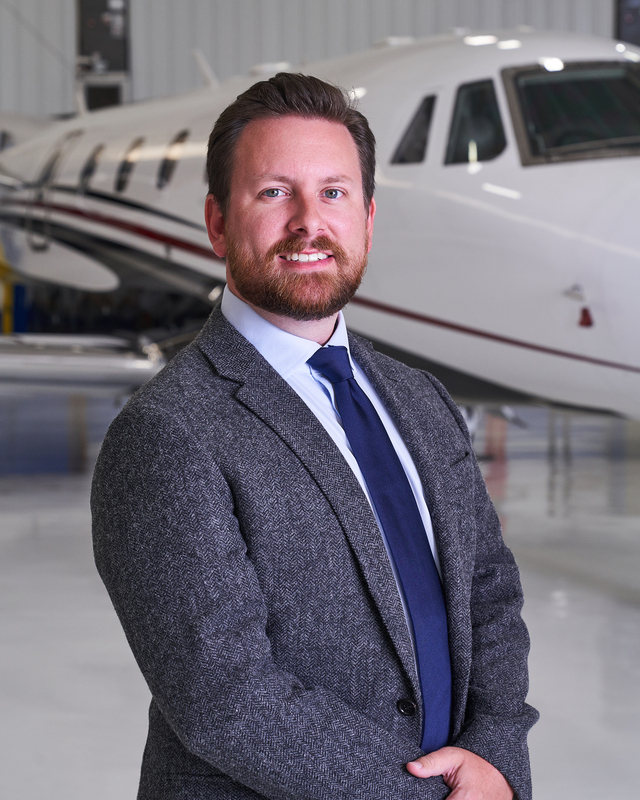 Steven came to Southern Sky Aviation in December of 2018 from Priority Jet, where he was Chief Operating officer for five years, as well as working in other capacities there since 2009. The expertise that Steven has in the many facets of aviation charter, management and maintenance will only strengthen the development of SSA as we continue to expand nationally as well as internationally over the next few years. Steven is an instrument rated pilot and a graduate of Clayton state University with a bachelor’s degree in Technology Management with a concentration in Aviation Administration. Steven’s collegiate studies included accounting principles, aviation and labor laws, and fleet management. He also graduated from West Georgia Technical College as a Certified Emergency Medical Technician Intermediate, Clayton Regional Law Enforcement Academy, and certified through the Georgia fire academy. Steven holds numerous certificates to include survival techniques, search and rescue operations, criminal investigations and crisis negotiations. 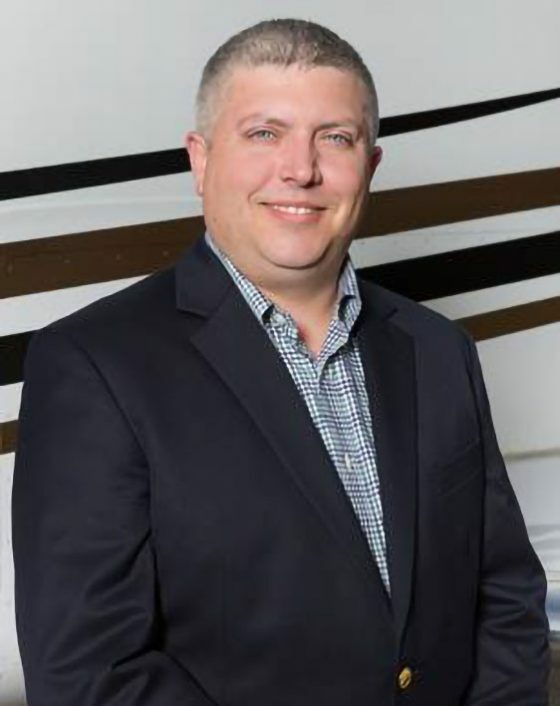 Steven has a demonstrated record of exceeding profitability goals and increasing market share within the industry. His presence and leadership in the metro Atlanta area is a perfect “next step” of growth for SSA. Lou began his aviation career with Rx Benefits in March of 2015 as the Aviation Supervisor. His position was responsible for all aspects of overseeing the company jet. This position was responsible for: calculating fuel, scheduling maintenance and up keep, managing the company hangar, providing scheduling of company trips, renting vehicles, driving clients to and from destinations, accommodations, and determining the most cost-effective way for company travel. 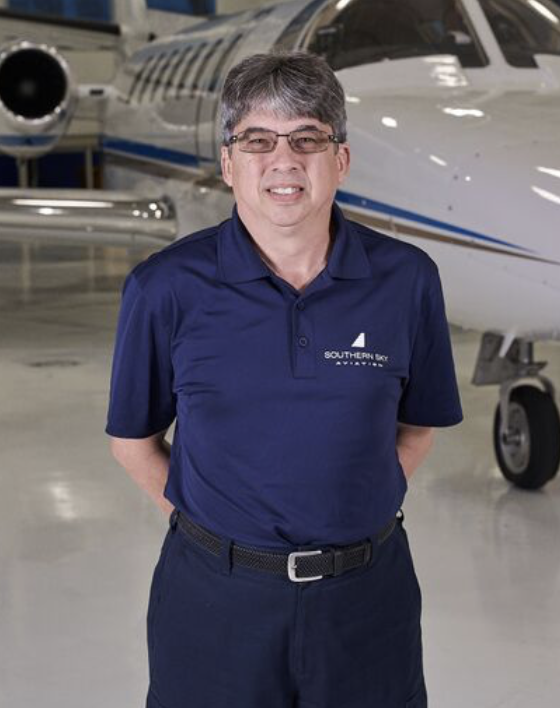 When a new company, JetFast365, started out in January of 2016, Lou was offered a position there as Aviation Supervisor, taking care of all developmental operations of the new company. He assisted in acquiring the 135 Charter Certificate for JetFast365, as well as building the company structure. 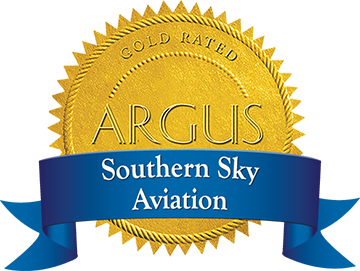 In 2017, JetFast365 became Southern Sky Aviation LLC. Lou was promoted to VP of Operations and his responsibilities changed. Lou was then tasked with the renovation project of the East and West ramp hangars. He was involved with the task of setting up all the tooling and equipment needed for the maintenance in both hangars. He currently controls all aspects of General Aviation Maintenance for the jet, turbo prop and piston including avionics and interiors. Lou also manages the airline maintenance for the thirteen commercial air carriers at Birmingham-Shuttlesworth International Airport. Lou has completed leadership classes and has many years of supervisor experience which he demonstrates in his day to day performance. He also has a strong mechanical background. 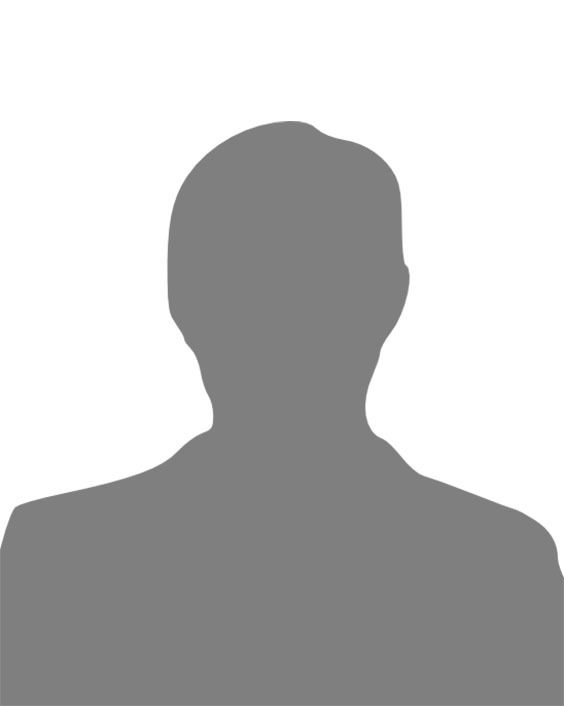 Lou has business administration experience and has completed Grumman Data Institute for computers and repair. 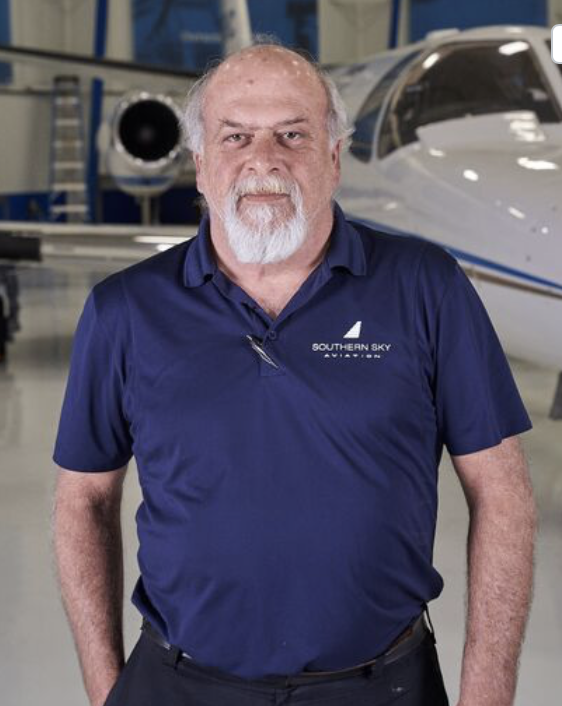 Bill Hindi is the premier Piston Maintenance technician for Southern Sky Aviation. Bill has been working in Aircraft Maintenance since 1980 and has held a wide range of positions in this field. 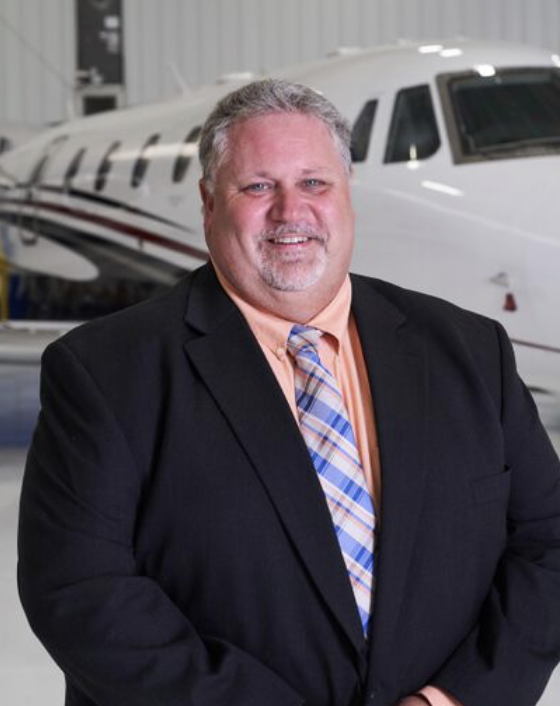 Along with his team, he has established Southern Sky Aviation as the leader in Piston Maintenance for Alabama and the Southeast. Bear has recently joined Southern Sky Aviation as the Director of Aircraft – Finance Operations. 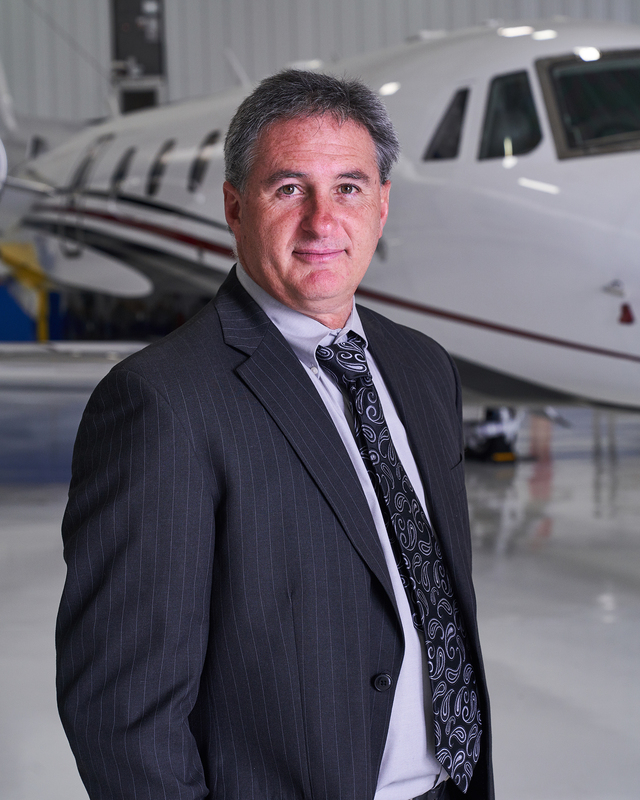 He came from Priority Jet, and has ten years of experience in aviation management, sales, charter, and leasing. During his ten years of experience in aviation, he has lead finance teams, aircraft sales and brokerage teams and aircraft charter teams. Bear started his aviation career with an aircraft sales company as an aircraft researcher. Within two years, he was leading not only his internal sales team, but also managed an aircraft charter company’s aircraft sales department for 3 years. After the sale of the charter company, he and the owner of the aircraft sales company expanded their services into aircraft leasing and management. While at the aircraft sales company, Bear worked with several private investors and “flipped” aircraft for over 4 years. 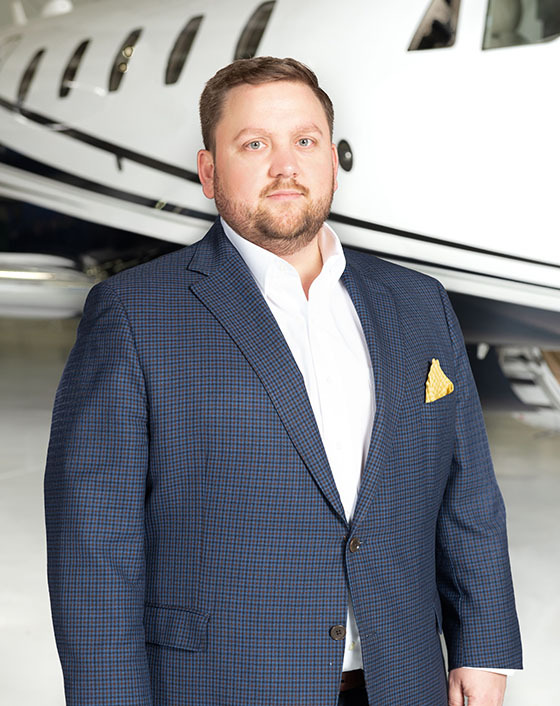 In 2017, he moved back into the air charter world with Priority Jet (aircraft management, charter, and maintenance company), as the Director of Owner Services, during that time he managed the relationships of the aircraft owners (charter partners) and their financials. In 2018, he was elevated to the position of Director of Finance, where he ran the day to day finances for the company. Prior to his time in aviation, Bear worked for a private Pepsi bottler and held several positions during his tenure. His last post was Administrative Support and he directly over saw the pricing and contract agreements for all customers within the Birmingham territory as well as monthly financial reporting and accounts receivables. Outside of work environment, Bear is involved in his community. Bear currently sits on the Leadership Team and on the board of trustees of the Gathering Place Church. Bear has been heavily involved in Student Ministries at the Gathering Place Church since 2015 and believes that they are not just our future but that they are our present. Prior to being at The Gathering Place Church, he was the Finance Chair and Council Chairperson for the Leadership Board of Moody United Methodist Church. Bear began his volunteer service as a Fire Fighter / Fire Instructor / Haz-Mat Technician for the City of Riverside from 2006-2013. Tom joined Southern Sky Aviation in 2018 as our Jet Maintenance Lead Technician. He brings over thirty years’ experience in Airframe and Powerplant Maintenance, working with companies such as Raytheon and JetSouth. This is where Tom was instilled with a focused team approach to the business aspect of a maintenance shop. The most recent twelve years were spent at Southern Company where Tom was a Senior Aircraft Technician. He has been able to apply his skills managing both scheduled inspections and unscheduled maintenance, as well as leading the younger technicians in learning trouble shooting procedures. He is an invaluable addition to our maintenance leadership. 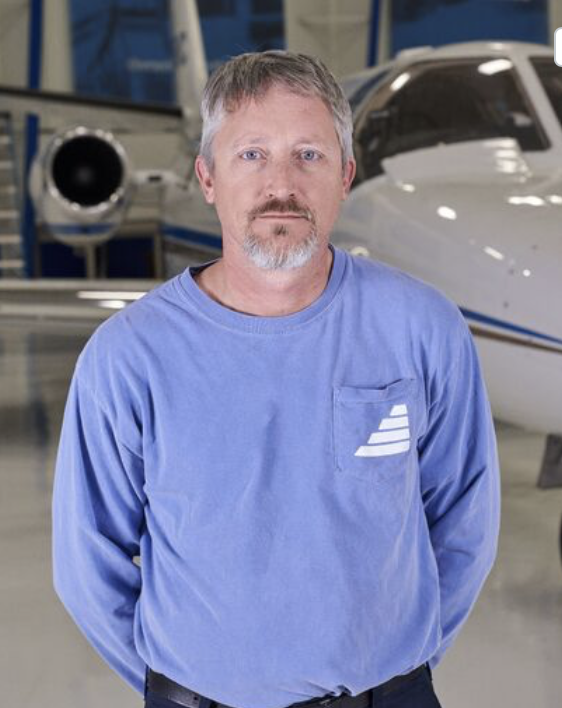 Gary is the Avionics Lead at Southern Sky Aviation and as 2019 begins, we anticipate his department being a huge contributor to our Maintenance Division growth. Gary has 33 years of avionics service which includes troubleshooting and repair, component level bench repair and installation experience on avionics systems from simple Nav/Coms to weather radar and autopilots in a wide range of piston, turbine, turbofan and rotor-wing aircraft, including Beechcraft, Cessna, Cirrus, Hawker, Learjets and Bell Helicopters. He also a multi-engine instrument rated commercial pilot. Wes joined the Southern Sky Aviation team in 2017 in as a Compliance Officer and Pilot. Prior to joining Southern Sky Aviation, Wes’s background included extensive experience in Airport Management. Wes graduated from Auburn University in 2010 with a Business Administration degree with an emphasis on Aviation Management. He spent the next seven years working from an entry level position in Airport Management at his hometown airport of Dothan, Alabama, to a supervisory position at the Huntsville International Airport in 2013, and ultimately to the position of Operations Manager at the Birmingham Airport Authority in 2015 where he managed a department of 50 individuals and was tasked with maintaining overall compliance with FAA and TSA regulatory guidelines pertaining to airfield safety and airport security. In 2018, Wes was elected to serve on the Academic Advisory Board for Auburn University’s Aviation Department. Wes has also been flying since 2008 and, in addition to other duties, is now a line pilot in our 135 charter operation. While working with the VP of Aviation, Wes’s administrative and management experience in aviation has been instrumental in growing SSA’s charter operation and market presence. 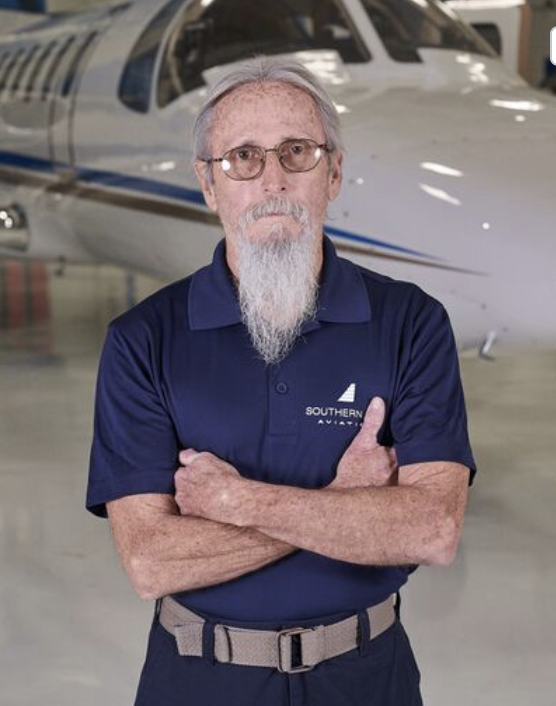 Mike came to Southern Sky Aviation in March of 2018. Watts Interiors has been a the leader in Aviation Interiors at BHM since 1976 and now brings those significant talents to Southern Sky Aviation. As a result of Mike joining SSA we have been able to create a “one-stop shop” for all maintenance and interior needs for our customers. Mike and Jeremiah have built a reputation as the experts in all things interior in the Southeast and are helping SSA continue to offer World Class service an all areas of maintaining your aircraft. Jeremiah came to Southern Sky Aviation in March of 2018. Watts Interiors has been a the leader in Aviation Interiors at BHM since 1976 and now they bring those significant talents to Southern Sky Aviation. As a result of Jeremiah joining SSA, we have been able to create a “one-stop shop” for all maintenance and interior needs for our customers. Jeremiah and Mike have built a reputation as the experts in all things interior in the Southeast and are helping SSA continue to offer World Class service an all areas of maintaining your aircraft. We’re looking for aviation professionals. At Southern Sky Aviation, we all share the same passion for flight. Please check our available positions. At Southern Sky Aviation, we all share the same passion for flight. Check out our available positions.